For over an hour crowds gathered and waited, basking in the sun, huddled around the tiny bandstand. The eye of the market stalls at Glastonbury came to a near standstill. 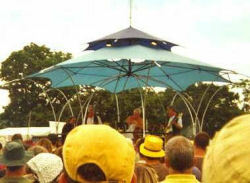 Due on at 2:00, The Wurzels didn�t arrive until nearly 3:00. After a quick drink with their families out in the open air they disappeared again. Five minutes and numerous glances at watches later they appeared. Dressed up as always, they made their way through the crowd and up onto The Bandstand, a tiny platform not far from the Pyramid stage. But the setting was an irrelevance. In an ironic way the almost insulting setting for the gig was charming. The Wurzels are about true fans, true fun, true love, and how better than that come across that when the fans can actually touch the stage upon which they�re playing. Usually saved for small local bands that no-one has ever heard of, the bandstand this time was for a local band that everyone knows and loves. No sooner had they started playing, the crowd swelled and the fans jigged. The hits kept coming, song after song. Such songs as The Combine Harvester, Morning Glory, I Am A Cider Drinker, Farmer Bill�s Cowman and many more thrilled the audience, who sung and danced along with delight. 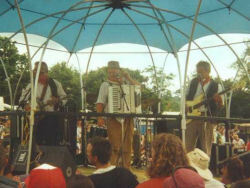 But the Wurzels can never be taken seriously and half the experience was the humour. When technical problems temporarily halted the music Tommy Banner (the Scottish Wurzel) quickly said "sorry we have a technical �itch. And my technicals have been itching all day"! After around an hour in the sun in fully clothed...well nearly. (Tommy has no excuse for scaring the kids by taking his top off) they made a get away attempt. But the crowd were �avin� none of it. Whistled, cheered, clapped and begged, they turned back and agreed to play an encore, despite John Morgan�s age of 72. The whole set finally ended with the classic Drink Up Thy Zider. With a large number of Bristol City fans in the audience (like me) this one got a huge response and was sung along to at the top of people�s voices. The final line was sung by all the audience "and so be weeeeeeeeeeeeeee!" to round off the best gig in Glastonbury�s illustrious history. After finishing they mingled with the crowd for a good 10 minutes, shaking hands, posing for photo�s, signing autographs, and talking to adoring fans while a core of Bristol City fans sung City songs like "City �till I die" and "all hate Bristol Rovers" much to the bemusement of the crowd from further a field. The gig was amazing and next time Michael Eavis must surely give them a proper stage so that more people can see them. No doubt if this had been advertised, it would have attracted a huge audience. Congratulations to the Wurzels for great music, great fun, great humour, great energy and a great gig. John Morgan, Tommy Banner, Pete Budd and Dave Winter...we salute you! "When the Wurzels finally took to a Glastonbury stage on Sunday they took the opportunity to sparkle among the mediocre acts that formed most of this years line-up. After a delayed start and early sound problems they kicked in and from the start had the crowd eating out of their hands and sent a message to the organizers that they needed a bigger stage. Combine Harvester stopped the human traffic and from then on the great unwashed witnessed what seemed like a home-coming. A stirring Morning Glory was my highlight, the crowd messmerised but at the same time in exellent voice. The hits obviously sent the crowd into cider overdrive and by the time Zider Drinker finished it up, a good few people had had their Glastonbury experience enhanced. The crowd, of course they wanted more but the boys had given their all. Me, I drank up and went home. David Bowie, looked crap on the telly." 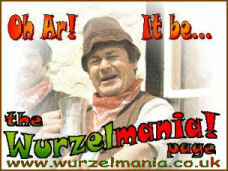 Having reviewed the Wurzelmania! website for PC Format magazine, it was with cyder-addled breath that I heard The Wurzels were due to make an appearance at the Glastonbury Festival. So, armed with a few cans of beer and a couple of 'spiritual cigarettes' from mother's cabinet, I made my way down to the site early on the Sunday in the hope the rumours might be true. Teaming up with PC Format cohorts Ian Harris and Kai Wood, already well-oiled after two days of scrump-addled activity, the three of us ambled our merry way to the bandstand, where we heard the Farmyard Four were due to make an appearance. It was almost inevitable that we'd chance upon the cider bus on our way - so we downed three pints of Devizes Sheep-dip (8.9%) to bolster our ardour. After a quick toke on the specialist tobacco, which sent young 'un Ian Harris into a royal tizzy, we espied the bandstand and repaired there in high spirits. No sooner did we arrive than I spotted Tommy Banner, looking resplendent in a white M&S vest and clutching a mobile phone to his ear. Introducing ourselves to the esteemed author of office favourite, Haggis Farewell, we enjoyed a light-hearted conversation before he was called away to perform. With the band due on stage in five minutes and the air thick with anticipation, we visited the beer tent one more time to oil our onions. No sooner did we return than The Wurzels took to the stage to riotous applause from the assembled hordes. Tommy Banner performed his party piece by stripping almost right down to the courgette and plums, prompting shrieks of delight from the ladies in the crowd. The band performed a selection of songs cherry picked from their extensive back catalogue, most memorable of which were a rousing I Wish I Was Back on the Farm - which prompted some roaring vocals from your correspondent - and a blistering Pill Pill, which had my esteemed colleague Kai Wood singing like a skylark. Virtually hoarse, we rallied for one final holler to the hedgerows when the Wurzels returned to the stage for a blistering Drink Up Thy Zider. Then it was all over, and the band posed for photos and signed autographs like a West Country version of Steps. Ian Harris started to cry, Kai Wood kept shouting for 'Pill Pill', but I simply smiled to myself. It isn't every day you see genius at play.